Cape Town is having a moment, emerging on to the world stage as a design capital, drinking and dining mecca, and all-round cool city. But to skip its classic charms and beauty would mean missing out on some truly unforgettable experiences. Frequent visitor Nikki Wallman shares the best of both worlds. Let’s be honest: Shakespeare kind of over-exaggerated when he said, “All the world’s a stage”. Some places are flat and dreary; some are beautiful but dull, and others must build magnificence where none naturally occurs. But Cape Town – South Africa’s Mother City; my mother’s (and father’s) hometown – now that’s a stage. Here, the dramatic natural setting of mountains, forests and beaches serves as a backdrop to an eclectic patchwork of cultures and fortunes, a tumultuous history and a hopeful future. Cape Town has also entered the global spotlight this year, earning a coveted year-long tenure as World Design Capital. It’s also 20 years since the abolition of apartheid; and it’s South Africa’s first tentative year as a nation without its spiritual and political father, Nelson Mandela. So, right now is a fascinating time to explore both the old and new Cape Town. Table Mountain looms large in the centre of Cape Town, photo-bombing holiday snaps and acting like an omnipresent grand dame: reassuring and solid and craggily beautiful. You can climb or take the cable-car to the top, but I choose to admire the majestic beauty from below, meandering through the serene Kirstenbosch National Botanical Garden. Nestled at the foot of the mountain, it’s a beautiful way to experience South Africa’s indigenous flora in the midst of the city. Next, I’m off with my dad to possibly the most stunning sports ground in the world, Newlands Stadium, where Australia regularly collects South African wickets as the sun sets behind Table Mountain. Afterwards, we drop into his old student haunt, The Foresters Arms, for a restorative Windhoek lager. Far from a soulless shopping mall, the beautiful glass arches of the V&A Waterfront host big-name international brands (Topshop, Burberry, Louis Vuitton) as well as restaurants and luxe hotels. It’s also the starting point for something I’m ashamed to admit I’ve never done before: the ferry trip to Robben Island. I’m dreading a touristy glossing-over of Mandela’s 18-year incarceration here (of a total 27) but, instead, our guide recounts its lesser-known military history and how he sees it as “a place of learning and debate”, not just hardship (prisoners discussed political issues as they broke rocks under the African sun). Our second guide – a former prisoner – walks us through the cold jail, recalling how the prisoners’ dreams were far bigger than the cells imprisoning them. The ocean that separates Robben Island from the mainland is the source of a rich bounty of seafood, and there are plenty of ways to sample it – from simple seaside restaurants to five-star dining with that inimitable African twist. Don’t miss the butter-soft calamari and sweet, juicy crayfish at Hout Bay institution Chappies (Chapmans Peak Beach Hotel). We feast here at sunset, after browsing the vintage dresses and African carvings at the super-chilled Friday night Bay Harbour Market nearby. A visit to our family’s favourite local vineyard, Groot Constantia, is a must (Napoleon, Dickens, Bonaparte and Baudelaire were also fans). Here, we enjoy a sun-dappled lunch of game carpaccio, sesame-coated salmon and a bottle of outstanding Gouverneurs Reserve white before exploring the whitewashed, 17th-century Cape Dutch buildings and magnificent views. 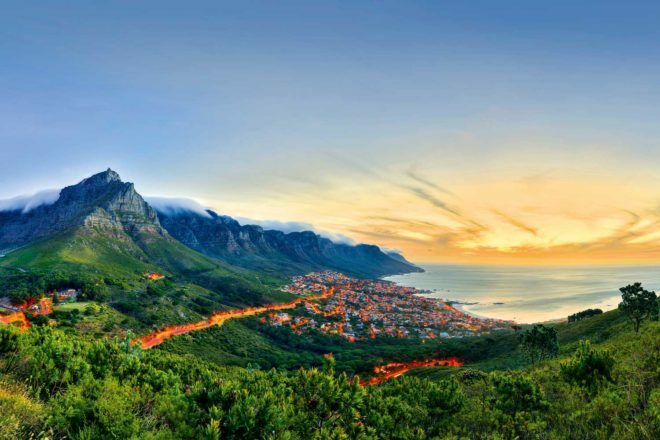 On the other side of the mountain, the Twelve Apostles overlook the golden sands and perfect, glamorous bodies on Clifton and Camps Bay beaches. We head to The Leopard Bar at The Twelve Apostles boutique luxury hotel for sundowners. All palm-patterned wallpaper and leopard print-vested waiters inside, the balcony overlooks a cinemascope of hypercolour as the sun sets into the Atlantic. We move to the nearby historic Roundhouse Restaurant – a former 18th-century guardhouse and hunting lodge – for an amazing four-course dinner of local flavours including desert river rabbit, east coast crayfish with citrus vanilla salad, and a cloud-like strawberry soufflé. The next day I check in to Cellars-Hohenort, a historic gem of a luxury hotel nestled amongst 9.5 acres of lush, beautifully tended gardens in the wealthy suburb of Constantia. The 48-room (and suite) hotel is a reflection of its owner, hotel doyenne Liz McGrath, whom I meet over breakfast: she is elegant and perfectly charming, with some fabulous stories. Reluctantly leaving my gorgeously appointed suite, I wander the grounds literally stopping to smell the roses before dinner in The Conservatory restaurant. My garden vegetable risotto is almost too pretty to eat – almost! – and the complimentary glass of the estate’s own dessert wine, available only to guests, is pure understated class. The buzz I’ve felt since stepping off the plane must be partly due to the new wave of designers, hospitality gurus and young entrepreneurs celebrating Cape Town’s status as World Design Capital in this year (2014). To sample some great design we hit Woodstock, a gritty urban suburb that’s steadily increased its cool cred as artists, designers and restaurants set up shop. We stop by Recreate, which sells repurposed furniture, like retro suitcases that have been turned into super-cute armchairs, before reaching The Neighbourgoods Market at the Old Biscuit Mill. After gorging on the smorgasbord of amazing breakfast options, we check out the reworked vintage denim from The Joinery’s stall, pick up some bold and beautiful African-modern jewellery from Pichulik, and browse the luxe patterned fabrics and ostrich leather handbags at Kat Van Duinen. Two of the hottest restaurants in Cape Town – The Pot Luck Club and The Test Kitchen – are also on-site. For a different insight into Cape Town’s cultural heritage, Mum and I embark on a fascinating tour of its Cape Malay quarter, Bo-Kaap. For cool bars and restaurants, my in-the-know cousins direct me not to guidebook favourite Long Street, but instead to the “way cooler” Bree Street and nearby Kloof Street. In the lively, cobblestoned courtyard of Weinhaus + Biergarten on Bree Street, I catch up with an old friend over a bucket of four of their finest house craft beers. The bleach-blonde girl next to me, a sommelier, tells us the nearby Publik Wine Bar is also fantastic, but we’re heading across the road to La Parada Bar, a pumping, low-lit tapas joint. We score a seat by the open window and order spicy steak, calamari, chickpeas and chorizo – all very tasty, though I think the real appeal here is the vibe. On Kloof Street, we meet my cousins’ friends at Yours Truly, a hip, leafy little bar next to a hostel popular with visiting models – hence the high ‘beautiful people’ count. At nearby The Power & The Glory, a little corner café and bar with a laidback, neighbourhood feel, we sit at the window bar seat and indulge in a spot of people watching over a bottle of wine. But I have to motor – it’s nearly show time at the Pink Flamingo Rooftop Cinema, part of the rooftop Airstream Trailer park at the Grand Daddy Boutique Hotel. I’ve opted to stay in one of the seven quirkily decked-out, vintage Airstreams that line the edges of the hotel’s rooftop (all are undergoing refurbishment and will re-open in September). My trailer, ‘Love of Lace’, is a sugar-‘n’-spice pink dream equipped with tiny bathroom, surprisingly spacious bed, mini bar, fridge and sofa. I can see the famous ‘tablecloth’ of cloud rolling over Table Mountain from my window; and outside my front door waits the bar and cinema, where I settle in with my picnic hamper and red wine on a comfy sofa to watch Life is Beautiful under the stars. Movie over, I toddle back to my trailer for a sound night’s sleep above the bustling city. Life really is quite beautiful right now in Cape Town. South African Airways operates code-share flights with Virgin Australia, flying from Sydney, Melbourne, Brisbane and Adelaide to Perth connecting onwards to Johannesburg and then Cape Town. Fares start from around $1925 (ex Perth) or $2150 (ex east coast). March and November are perfect – warm but not too hot, with sunny days ideal for exploring the beaches, mountains and city. It starts to get chilly in April/May; wet from June to August; warming up again September/October. • The most convenient and safest option is to hire a car (Cape Town airport has a number of services). • New My Citi buses (myciti.org.za) has increased safety, connectivity and comfort. • Ask your hotel for taxi or private car recommendations and pre-book rather than hailing one in the street. Wooden and stone carvings from local markets and street artists; African print kaftans, silky pants and cotton dresses; bold jewellery and ingenious tin-can or beaded sculptures.